So I’ve been reading up on how to “Extreme Coupon” in Hawaii. Apparently, it’s very hard to extreme coupon here because Hawaii doesn’t double or triple coupons the way the mainland states do and the prices over here are marked up to begin with (since almost everything is shipped here to begin with). However, there are still ways to get stuff for free or at the least for VERY CHEAP using coupons in various forms. I’ve also read that people who are part of a military family are lucky since they have access to the NEX/Commisary, which supposedly allows you to use coupons for an extended period of time, up to six months after the expiration date (I’ve read this, but their written policy says they don’t accept expired coupons) Another benefit is cheaper prices than the outside grocery stores. I’d check with the NEX/Commisary on their policy just to make sure though. You can call them or read up HERE on their store and coupon policies. I don’t have access to the NEX/Commisary myself, so I won’t be much help there. So far, what I’ve found out is that here in Hawa ii, it helps to have a Safeway account online. By logging in, you can add deals and coupons onto your safeway card, as well as print your shopping lists for those deals and coupons. Also, Safeway seems to have an exclusive “deal match” section for “Oahu residents only“. 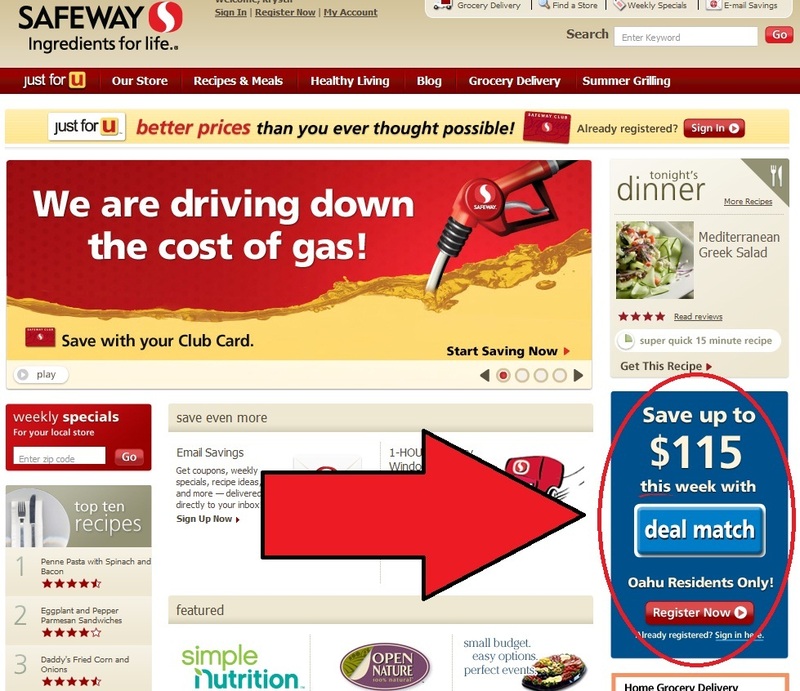 This allows users to add deal match prices from other stores may so that you may get them matched at the Safeway store automatically though the Safeway card. This makes it convenient because you can just make one stop at Safeway versus all your other stores. As for other deals, I’ve also read that Target has a good coupon policy (probably because they’re a corporate chain retail store). So don’t forget to check out the Target coupons as well as sign up for their mobile coupons. The mobile coupons are special coupons sent to your cell phone via a text message link you can access to various mobile coupons. It has a special barcode that the cashier’s can scan straight off your cell phone screen. As always, message and data rates do apply for whatever cell phone messaging or data plan you have. Oh, and there’s always the Target Weekly Ad which is out every Sunday. So far, this is all I have for you guys. I’m just getting started, but I hope this helps!